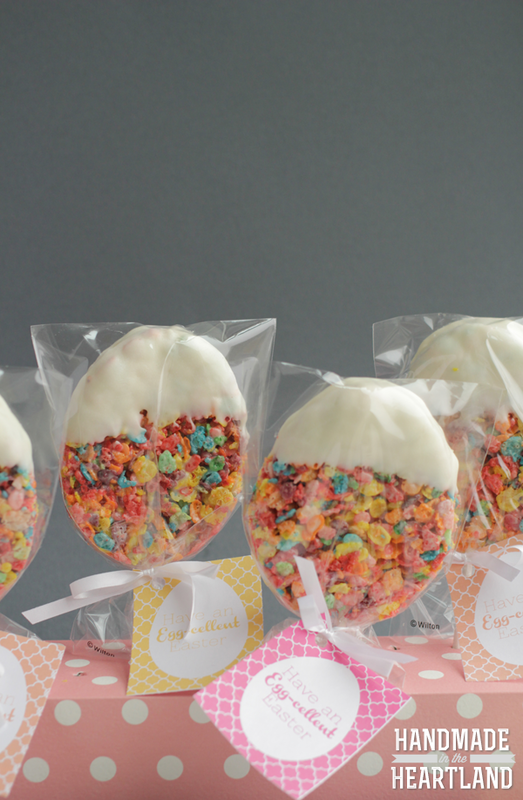 Fruity Pebble Easter Egg Treats with Printable! 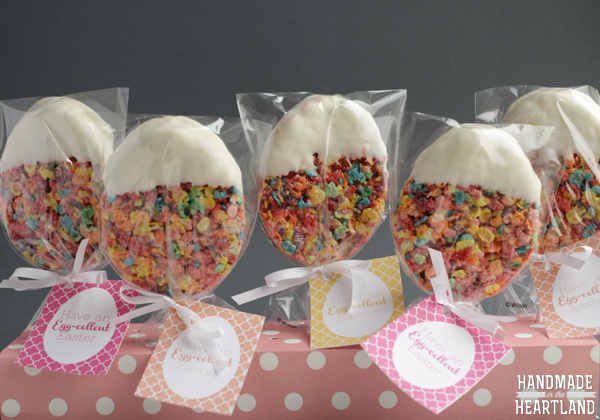 Home Recipes Desserts Fruity Pebble Easter Egg Treats with Printable! 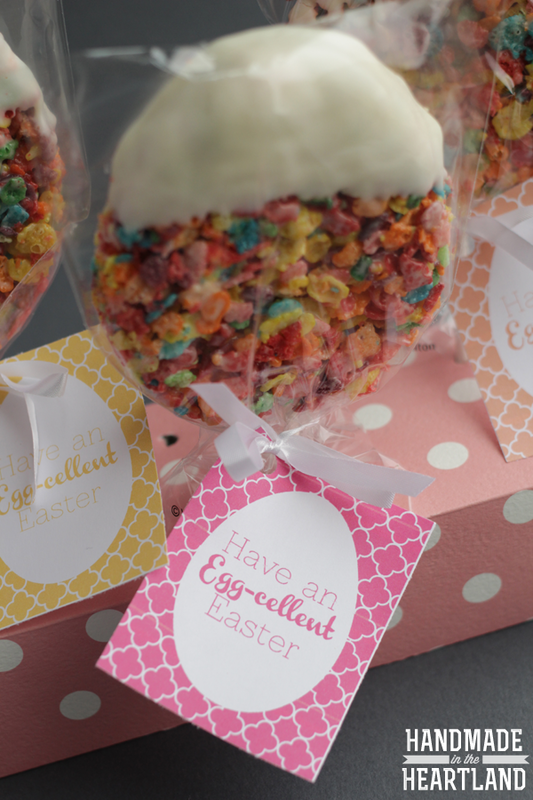 Easy fruity pebbles “krispie” treats cut out in egg shape with a free Easter egg-cellent gift tag make a cute and easy Easter gift! This post contains affiliate links. So I’ve been brainstorming Easter ideas to share with you guys and I came up with these fruity pebble Easter egg treats. 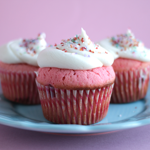 They are basically a rice krispie treat but you replace the rice krispies with fruity pebbles. I normally don’t buy sugary cereals so when matt noticed them in the pantry he was super excited. I’m going to go ahead and say I’ll always make fruity pebble treats instead of rice krispie from now on because they are so good and I love the bright colors! I used a large easter egg cookie cutter and cut out eggs to make them more festive. If you wanted to make these into a little easter treat to give out to friends and family you can download this free printable to attach to them. I just printed them out on my home printer on heavier paper. To make them into “pops” I just used wilton cake pop sticks and stuck them into the treat after I cut them. I also found the cellophane bags in the wilton/craft aisle at Walmart- they were cake pop bags that came with the ribbon, so easy and convenient. If you’ve ever made rice krispie treats you know that the most annoying part about the process is the sticky mess. 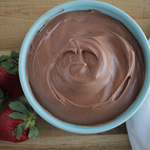 Watch the video below to see how I make these with NO MESS. It’s amazing! 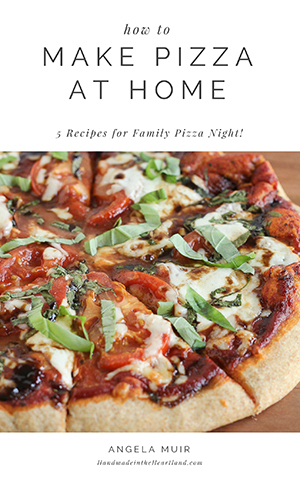 I use the Demarle at Home Large Round Mold and Silpat which nothing sticks to, and to make it even easier it’s all done in the microwave! Ready to change your rice krispie making world? Go grab yourself a large round mold. It’s going to change your life! 1. Place butter into Large Round Mold and microwave for 30 seconds or until melted. Add marshmallows to the mold and coat evenly with butter. Microwave for 1-2 minutes.2. Once the marshmallows are melted add fruity pebbles and stir to combine. Pour onto a Silpat and pat down to an even thickness. 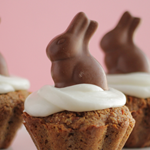 Cut out with Easter egg cookie cutter. 3. 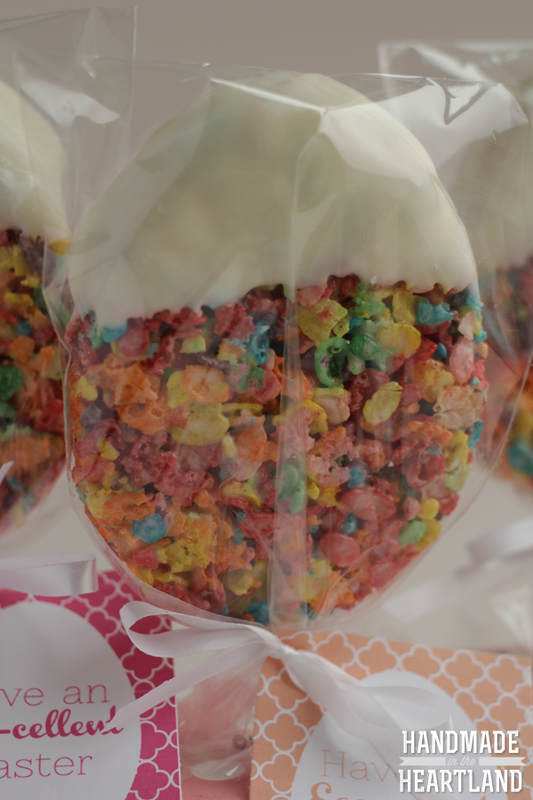 Melt candy melts according to package instructions and dip the fruity pebbles treats into the candy melts to coat. Place back on a Silpat to dry. Peel off Silpat and enjoy!